Questo è un elenco parziale delle fonti consultate nella realizzazione di questo blog e dei miei libri Luna? Sì, ci siamo andati! 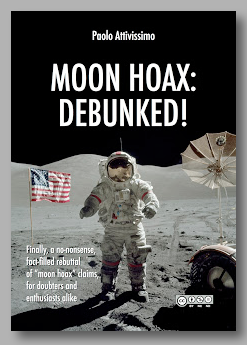 e Moon Hoax: Debunked! ; le ho trovate preziose per conoscere meglio le missioni lunari e spaziali in generale. I principali siti Internet dedicati alle missioni spaziali e alla tecnologia aerospaziale sono elencati nella colonna di destra di questo blog. Apollo 11: trascrizione integrale delle comunicazioni terra-aria (Nasa.gov, 15 MB). Apollo 11 Photography Index - 70 mm and 16 mm (Nasa.gov, 7 MB). Lunar Module News Reference - J Missions, Grumman, per gentile concessione di Bob Andrepoint (Scribd, 55 MB). Proceedings of the Apollo Unified S-Band Technical Conference, Goddard Space Flight Center, July 14-15, 1965 (24 Mb PDF); K.E. Peltzer, Program Committee Chairman, Goddard Spaceflight Center, 1965; NASA SP-87. Apollo Unified S-Band System (1.7 Mb); K.E. Peltzer, Manned Flight Support Office, Goddard Space Flight Center, April 1966; NASA TM-X-55492 / X-506-66-156. Lunar TV Camera: Statement of Work (Final Draft) (3.4 Mb PDF); NASA/MSC, 15 August 1966. TV Show of the Century: A Travelogue with No Atmosphere (1.6 Mb PDF); Stanley Lebar and Charles P. Hoffman, Electronics, March 6, 1967. Document courtesy Stan Lebar. Lunar Television Camera: Pre-Installation Acceptance Test Plan, NASA/MSC-SESD-28-105 (0.5 Mb PDF) 12 March 1968. The Lunar Television Camera, E.L. Svensson, Westinghouse Engineer, No. 3, March 1968, pp. 46-51 (0.5 Mb PDF). Apollo Lunar Television Camera: Operations Manual (3.9 Mb PDF); Stan Lebar, Westinghouse Defense and Space Center, 30 August 1968. ALSEP Data Handling Estimates (198k PDF); BellComm Memorandum for File B69 05062, R.J. Pauly, 12 May 1969. Apollo 10 Color Television (152k PDF); Westinghouse Defense and Space Center News Release, 16 May 1969. First Color TV from Space (207k PDF); Warren C. Wetmore, Aviation Week and Space Technology, p18-20, 26 May 1969. Mankind's Giant Leap (104k PDF); Robert Hotz, Aviation Week and Space Technology, p. 17, 28 July 1969. Network Controller's Mission Report Apollo 11 (5.0 Mb PDF); 15 August 1969. Communications on the Moon (3.6 Mb PDF); Electronics World, August 1969. EVA Communications from Surveyor III Site on Apollo 12 (640k PDF); BellComm Memorandum for File B69 10020, I.I. Rosenblum, 8 October 1969. The Probability of an ALSEP Accepting an Erroneous Command (542k PDF); BellComm Memorandum for File B69 12007, J.E. Johnson, 1 December 1969. Apollo Color Television Camera (0.8 Mb PDF); L.L. Niemyer, Jr., Westinghouse Defense and Space Center, 16 September 1969. Apollo 13 Television (1.7 Mb PDF); Westinghouse Press Release, 1970. Manned Space Flight Network (MSFN) Postmission Report on the AS-506 (Apollo 11) Mission (17 Mb PDF), Goddard Spaceflight Center; February 1970. Apollo Black-and-White Television Scan Converter (2.3 Mb); M.V. Sullivan, SMPTE Journal, vol. 79, pp. 621-625, July 1970. Ground Control Television Television Engineering Notebook, Richard Bohlmann e coll., Manned Spacecraft Cente, April 1971- April 1972 (HTML link). Ground-Controlled Television Assembly: Operation and Checkout Manual (7.0 Mb PDF); RCA, 24 May 1971. Apollo Color Television Subsystem: Operation and Training Manual (3.8 Mb PDF); Westinghouse, 1 June 1971. Apollo 15 Final Lunar Surface Television Operations Plan (8.0 Mb PDF); NASA Manned Spacecraft Center, 5 July 1971. EVA VHF Communications with LM on Apollo 15 Traverses (1.6Mb PDF); BellComm Technical Memorandum TM-71-2034-2, I.I. Rosenblum, 16 August 1971. Comparison of Measured LM/EVA Link Transmission Losses on Apollo 15 with Predicted Values (895k PDF); BellComm Memorandum for File B71 12012, I.I. Rosenblum, 20 December 1971. Ground-Controlled Television Assembly: Interim Final Report (4.2 Mb PDF); RCA R-3838F, 25 February 1972. Ground-Controlled Television Assembly: Final Report (8.6 Mb PDF); RCA R-3901-F, 29 December 1972. Apollo Experience Report - TV Systems (1.7 Mb PDF); Paul P. Coan, Manned Spaceflight Center Television Subsystem Manager, NASA Technical Note TN D-7476, November 1973. Shooting the Apollo Moonwalks (0.15 Mb); Sam Russell. The Color War Goes to the Moon (0.8 Mb); Stan Lebar. 35 Years Ago, "One Small Step..." (0.4 Mb PDF), Jack Yanosov and the development of the PLSS radio unit. John Dilks (K2TQN), QST, February 2005. Comparison photographs of the Apollo 11 Lunar Television as seen at Goldstone, Honeysuckle Creek, and Houston (4.4 Mb); Colin Mackellar, December 2005. Questa sezione è in lavorazione. Apollo 11: registrazione integrale delle comunicazioni radio (in streaming, Live365.com). 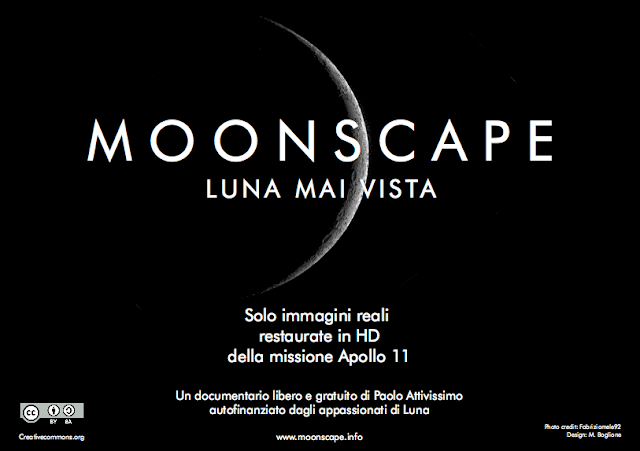 Apollo 11: riprese varie in 16mm (Archive.org). Apollo 11: diretta TV parzialmente restaurata da Lowry Digital a luglio 2009, disponibile anche in qualità broadcast (Nasa.gov). Apollo 15: riprese varie in 16mm (Archive.org). 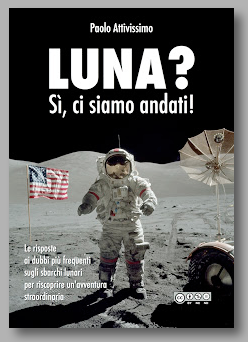 Siamo andati sulla Luna? di Piero Bianucci, Scienza e Paranormale n. 37, maggio-giugno 2001, pagg. 26-32. I ragazzi della Luna, Walter Cunningham - Mursia, 2009, ISBN 978-88-325-4256-8 (recensione).